The inaugural day of the Uttar Pradesh legislature’s budget session today was marked by unruly scenes with paper balls hurled at Governor Ram Naik by Opposition members, even as he addressed the joint sitting of the two houses. In the chaos and pandemonium marked by the slogan shouting by the Opposition, Samajwadi Party (SP) legislator Subhash Pasi hurt himself in the head after slipping from the table. He was later rushed to hospital for treatment. 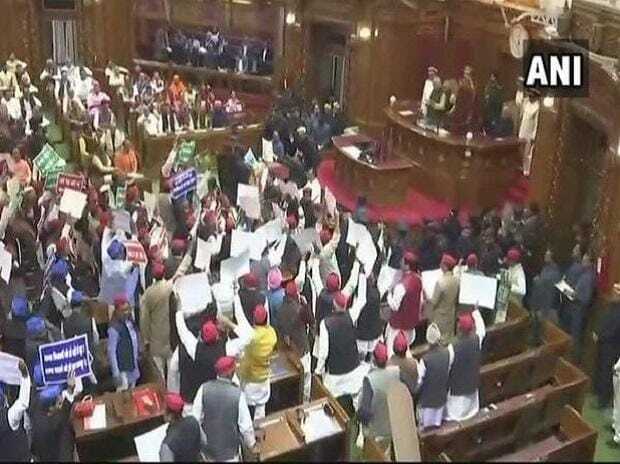 No sooner had the house assembled for the day’s proceedings, Opposition legislators carrying placards and banners began shouting slogans against the Yogi Adityanath government over the alleged failure of the law and order machinery. The entire Opposition consisting of SP, Bahujan Samaj Party (BSP) and Congress members started creating commotion, although Naik remained undeterred and continued reading out his speech till the end. House marshals had a hard time shielding the governor from paper balls hurled by the angry Opposition members. The marshals dextrously used file covers for batting off paper projectiles aimed at Naik. The opposition raised slogans such as “Kanoon vyavasthatrasta hai, Yogi mast hai” (law and order is in shambles, while Yogi is gleeful), “BJP janatasedarti hai, CBI, ED ko aagekarti hai” (BJP fears public, uses CBI, ED as cover), “Kisaan virodhi ye sarkar, nahi chalegi” (This anti-farmer regime won't last) etc. When the disruption by the Opposition benches persisted, the house was adjourned for the day. Later, chief minister Adityanath flayed the pandemonium and the disrespect shown to the governor during his customary address. “The Governor is the representative of the state and its constitutional head. The act of the Opposition, particularly Samajwadi Party, is condemnable,” he noted while addressing the media. Meanwhile, the Adityanath government would table its third Annual Budget 2019-20 on Thursday. With the 2019 Lok Sabha polls just months away, the size of the UP Budget is expected to touch Rs 4.75 trillion, which would be 11 per cent higher than UP Budget 2018-19 of about Rs 4.28 trillion. During election years, successive UP Budget seizes have witnessed hikes of almost 15 per cent compared to non-election financial years, when the average increase in size has flanked 10 per cent. Last year, UP Budget had risen by 10 per cent compared to the Annual Budget 2017-18 of Rs 3.84 trillion. The state budget session commences tomorrow. The Budget is likely to give a major leg up to the agricultural, social and infrastructure sectors for trying to capitalise on the positive sentiments of the people during poll campaigning and later voting. The BJP government would also attempt to top up the pro-agriculture footprint of the Union Budget 2019-20 with supplementary schemes to provide succour to farmers, the largest chunk of voters in the state.